Related theme: The Polish Olympic Committee celebrates 100 years. Stage4: all-new arrival on the Kocierz wall (gradients 20%). 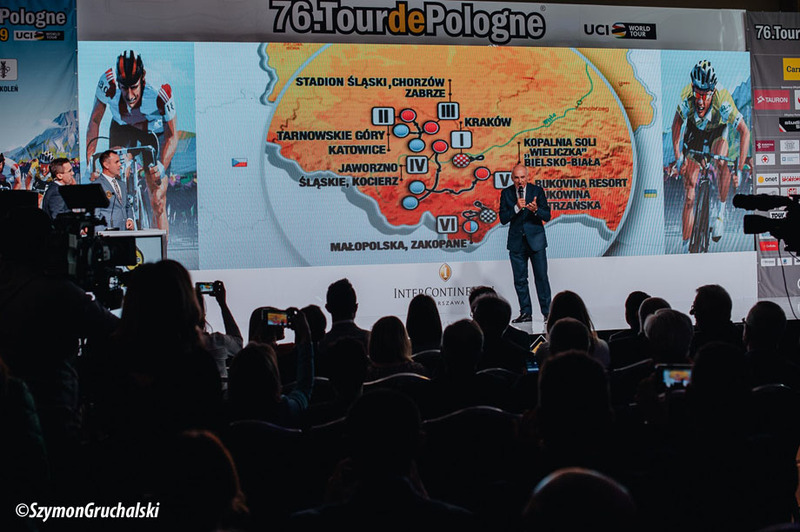 The Hotel InterContinental in Warsaw was the setting for the event that officially kicked off of the 76th edition of the Tour de Pologne – UCI World Tour. 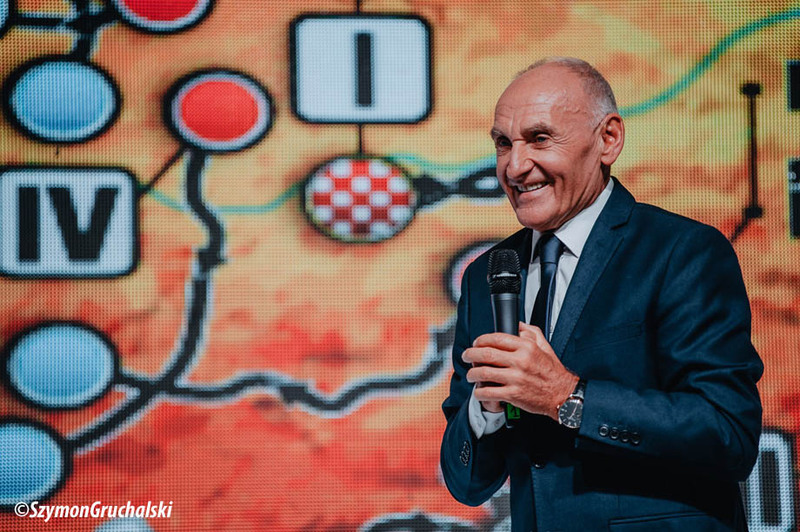 General Director for the Tour de Pologne Czeslaw Lang served as Master of Ceremonies. The race was introduced in a modern and appealing format featuring plenty of multimedia content, so this moment could be enjoyed not only by the official guests in the conference hall (which included government representatives, sponsors and media); the greater public could also witness the event thanks to live television coverage on the Polish channel TVP Sport and live streaming on the race’s YouTube channel. Before delving into the 2019 edition, a poignant video celebrated Michal Kwiatkowski, bringing back glorious memories of the spectacular feats he pulled off to triumph in his native race last year. 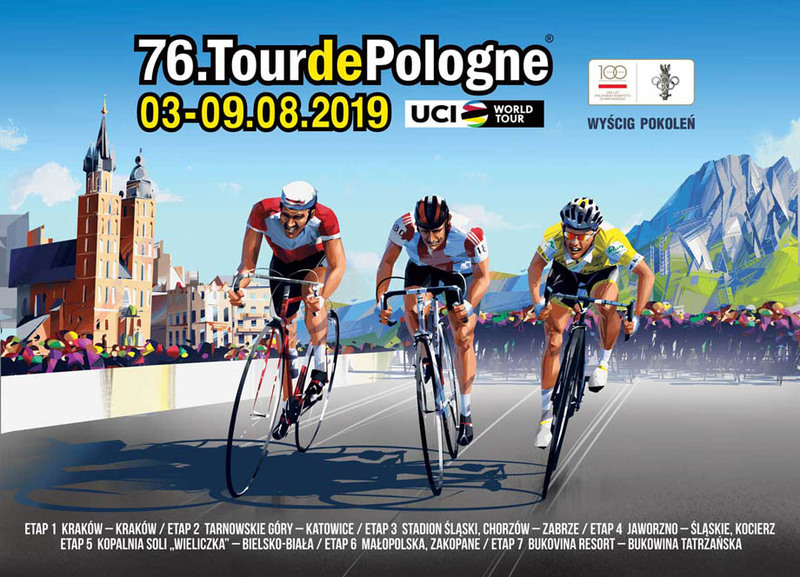 The background theme for the 2019 edition of the Tour de Pologne will feature Olympic Sports as part of celebrations commemorating 100 years of the Polish Olympic Committee. This 76th edition of the Tour de Pologne will feature amazing graphics. The layout is a design of the three generations of Polish cyclists who are all riding toward the Olympic dream. The drawing depicts (from left to right): Ryszard Szurkowski (two Silver Olympic medals in the time trial, Monaco ‘72 and Montreal ‘76), Czeslaw Lang (Silver medallist at the 80 Moscow Olympics) and Rafal Majka (bronze at the 2016 Rio Olympics). In the background there are images representing the city of Krakow, the location of the Grand Depart, and the Tatra Mountain which symbolize the final of the race. “With the 76th edition of the Tour de Pologne taking place a year before the Olympic Games, this will be a perfect beginning as we pedal towards Tokyo 2020. We will commemorate all of the great Polish Olympic Champions and we hope to inspire the athletes who are dreaming of participating and perhaps even winning a medal in next year’s Games. In my career I have had the privilege of experiencing this excitement, and I know how important it is for an athlete,” says Czeslaw Lang, Silver Medallist at the ’80 Moscow Olympics and the first Polish professional rider to race beyond the Iron Curtain. “We’ve designed a route that follows tradition but also introduces plenty of new elements. The first two days, with the arrivals in Krakow and Katowice, will be dedicated to the sprinters. Things will start to heat up in the third stage; like we did in 2018, we will set off from the Slaski stadium in Chorzów, but this year the show will be more elaborate, as the group will ride a lap around the city circuit and then do another lap inside the stadium. The fourth stage will definitely offer the biggest surprise. In fact, this fraction will feature an all-new arrival for the Tour de Pologne; the climb to the finish line at Kocierz is a steep wall, about 1 km long with gradients of more than 20%. This gruelling climb promises to be spectacular as the riders go all in and discover how far they can push their limits. The fifth stage will return to the finish line in Bielsko-Biala, where the sprinters will have to pay close attention if they want to win; in fact, last year it was Kwiato himself who came out ahead here with a fantastic victory. Then there is the sixth stage in Zakopane, which has been laid out on a new route rendered even more spectacular with an excruciating final climb about 4 km from the arrival. It will be the perfect launch pad for anyone who wants to plan an all-out attack. As always, the seventh and final stage will be the grand finale on the challenging circuit in Bukowina Tatrzanska, the perfect terrain for whoever will have enough strength left in their legs to come up with a winning strategy. We are hoping to have the usual champions lining up for the start, including Michal Kwiatkowski and Rafal Majka, who are two of the most recognizable riders from our movement, as well as lots of other stars from the international cycling scene. Not to mention the fact that every year the Tour de Pologne is famous for discovering up-and-coming, promising new young riders and bringing them into the limelight. I’m also happy to remind you that in 2016 Alberto Bettiol, who recently won the Ronde van Vlaanderen, made it to our final podium in third place,” explains Czeslaw Lang. A Representative from the Municipality of Warsaw came up on stage, as did representatives from the various cities and towns that will be hosting the stage departures and arrivals. Special guests also included a representative from the Ministry of Sports and Tourism and representatives from the Olympic Committee, including President of the Polish Olympic Committee Andrzej Krasnicki and President of the Polish Cycling Federation Janusz Pozak; of course, there were also the sponsors who support the Tour de Pologne project with passion and commitment, without whom none of this would be possible. There were also lots of riders from yesterday and today who have made up the history of the Tour de Pologne, along with heads of the UEC (Union Européenne de Cyclisme) with Wojciech Walkiewicz, Honorary President, and Alexander Gusyatnikov, Vice-President; let us also not forget Agata Lang, Vice-General Manager of the TDP, who is also Vice President of the UEC board of directors. There are 4 jerseys in the Tour de Pologne: the YELLOW jersey for the leader of the general classification (sponsored by CARREFOUR); the MAGENTA jersey for the mountain grand prix (sponsored by TAURON); the WHITE jersey for the best sprinter (sponsored by LOTOS); the BLUE jersey for the most active rider in the pack (sponsored by LOTTO). Prizes are also assigned for: the classification for the best Polish rider (sponsored by LOTOS) and the team classification. 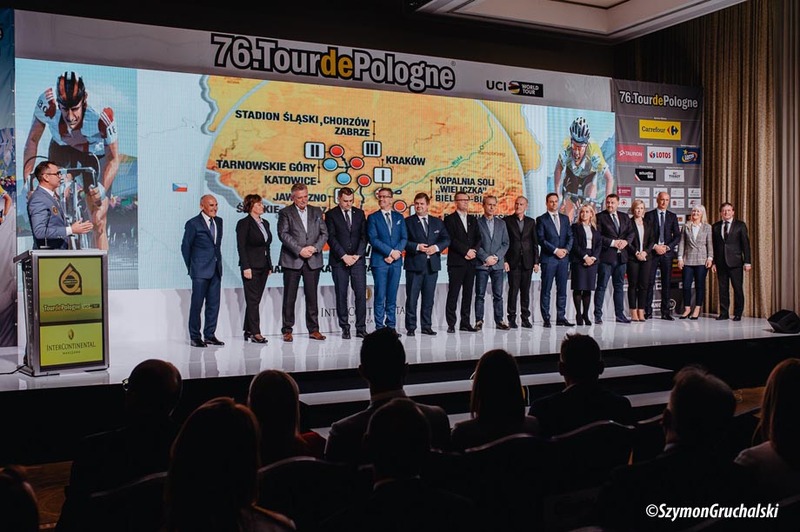 The throngs of guests attending the event also included Piotr Wadecki, Sports Director for the CCC Team and Technical Commissioner for the Polish National cycling team, and Renat Khamidulin, Team Manager for Gazprom–RusVelo. The Polish National team, and team Gazprom – RusVelo, along with team Cofidis and Novo Nordisk are the four teams that have already received wild card invitations from organizers to take part in the race together with the 18 World Tour teams that will participate by right in the 76th edition of the Tour de Pologne. The UCI World Tour de Pologne is traditionally held in association with two important initiatives that are enjoying increasing popularity and enthusiasm every year. One of these events is intended specifically for young people. It is the Kinder+Sport Mini Tour de Pologne which features a non-competitive ride for all children ages 7 to 12, to take place before the arrival of the pros (in 6 out of the 7 stages in the TDP, except for the last stage in Bukowina Tatrzanska). For logistical purposes, in the 4th stage with arrival in “Slaskie, Kocierz”, the ride will take place at the start of the race. This initiative will be held in conjunction with the Kinder+Sport Mini Tour de Pologne CUP, a competitive event featuring a team race for kids in clubs (11-14 years old). Points will be assigned every day and at the end of the 5 races the best 3 classifications – boys / girls / teams – will be invited on to the final podium in Bukowina Tatrzanska to receive their prizes along with the professional riders. These are two important events patronized by the Ministry of Sport that are aimed at promoting sport and healthy lifestyles among young people. The other event is a race open to enthusiasts. The last day of the Tour de Pologne traditionally features a race for amateurs and cycling tourists called the Tour de Pologne Amatorow. General Manager for the TDP Czeslaw Lang, along with other guests from the world of cycling, will be in the starting line-up for the race, which will be held against the splendid backdrop of the BUKOVINA Resort. Part of the registration proceeds will be donated to help cover medical costs for Ryszard Szurkowski, an ex-professional Polish rider, who is a good friend of Czeslaw Lang’s and of the Tour de Pologne. Ryszard is facing a long and arduous rehabilitation process, which he is undergoing to recover from injuries he sustained in a terrible bike accident last year. The Amatorow race will take enthusiasts along part of the same route ridden by the pros during the spectacular final stage in Bukowina Tatrzanska. Year after year, more and more fans line up to start in this event, which sends an important message about a growing passion for two wheels in Poland. In 2018, more than 2500 cyclists participated in the race. And last but not least, the Mobile Museum will once again be at the race every day this year. Last year this initiative enjoyed tremendous success. The museum exhibit contains an exciting history of cycling as well as artefacts and remarkable items from the Polish race. Furthermore, in this edition there will be a village called “Wyscig po Zdrowie” set up every day in the various stage locations, featuring various attractions and initiatives aimed at promoting a healthy lifestyle and disease prevention through diet, physical activity and much more.